NHCC.com will be there for photos, livestream (begins at 10:30am), race video and post race interviews! If you were looking for excitement, this young XC season has not disappointed. While every new season comes with surprises the shuffling at the top of the rankings leader board over the last few weeks has made the North-South Invitational this weekend a great opportunity for a number of teams to show they want that top spot. This year’s boy’s race will showcase six of the top ten teams facing off and most notably the top three will clash for the second time in ten days. Onto the predictions. Concord (NH-1) has been the surprise of the season starting out in the 9th position in the state rankings, but jumping all the way to the top after the Cofrin Classic. It’s easy to see why. The addition of track standout Jamie Wilkes added to an already strong front pair of Spencer Oliver and Forest MacKenzie to make Concord nearly unbeatable up front. That said, they likely would have come in behind Pinkerton and North if not for a strong freshman Ryan Devine, who is already running in the low 17s. Follow that up with Junior Alex Ducan and this winning prediction looks like it will hold true for next year in addition to this one. North may come next in the state rankings but the last two weeks saw these two teams go 1-1. North won a hill heavy Mt. Washington Invitational but Pinkerton (NH-3) squeezed out the narrowest victory on the flat NHTI course. With that NHTI course more closely resembling what we’ll see this weekend at Mines Falls, Pinkerton gets the nod here. 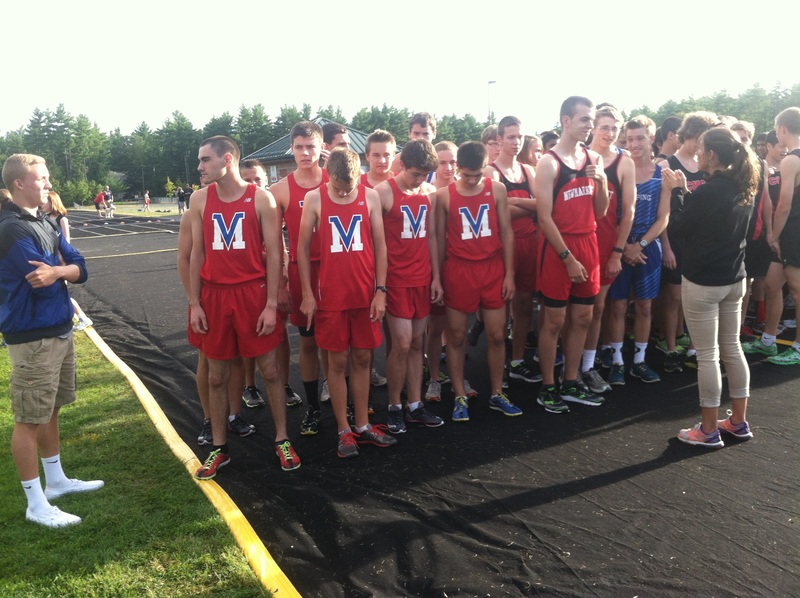 Pinkerton also looks like a team with a lot of upside as this is the first year on varsity for six of their runners. As they get more experience this gives them a lot of room to grow as a team and hopefully avoid some early racing mistakes. Top man Calvin Graves has stepped in nicely to replace the injured Pat Bastek and is quickly making a name for himself. In the end, picking between Pinkerton and North (NH-2) is a total coin toss. North has one of the most experienced varsity groups in the entire top ten. They returned a large portion of the 2015 squad including top man David Vorbach who is off to a blazing start. At the Paul Letarte invitational, Vorbach and Connor Muise proved that they’re in the running for the strongest front pairing in the state. They took down top ranked Pinkerton in that race by a decent margin riding strong runs from their three through five runners. If those guys have a showing at Nashua like they did at Paul Letarte, they could quickly knock Concord off the top of the list. Little gap here to the next couple of teams. These guys could be considered the dark horses, so while they’ve got a challenge ahead of them to get into the top three, don’t count either our fourth or fifth picks out. Londonderry (NH-7) graduated a great squad, so their varsity is made up of a lot of new young guys. 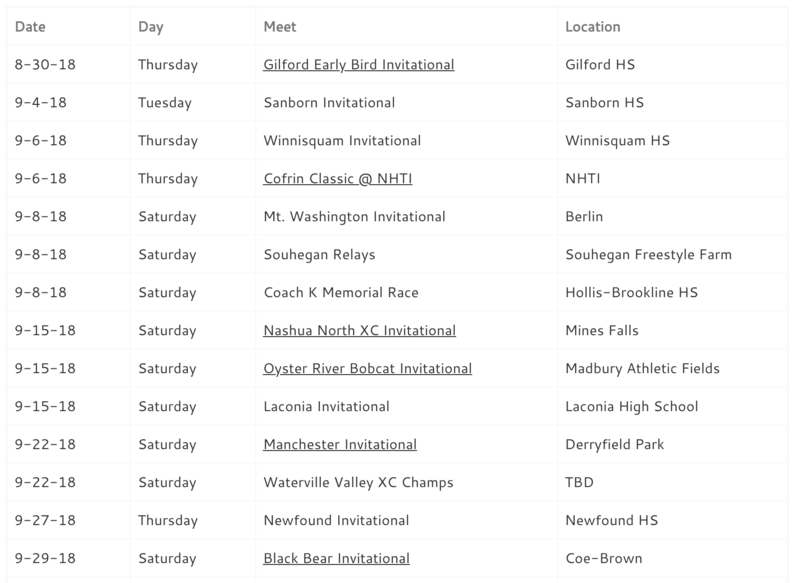 Additionally, while LHS has looked strong in a couple of dual meets and performed well at the Souhegan Relays this past weekend, they remain a bit of a mystery having not attended a “normal” 5K invitational so far this season. Their top three of Chris Zaino, Declan Hotter and Jake Donnelly look like they’re ready to mix it up with the main packs of the other teams based off of the dual meet results, but until we see them in a big race, it’s hard to see what they’ve got. South (NH-8) returned most of a strong varsity team this season but from a results standpoint so far they’re tough to judge. A dual meet at home had their varsity guys appearing to run a workout while they took a third behind North and Londonderry at the Souhegan Relays. That said, they brought back too many strong returners for that #8 state ranking to last very long. Look for them to be right in the mix once things get started on Saturday, but where they’ll fit in is anyone’s guess. Of note, Alvirne (NH-9) is also competing. This presents a perfect opportunity for the Broncos to move up the rankings if they can upset any of the above! With 16 schools arriving at Nashua tomorrow, it is guaranteed to be a very exciting early season matchup. 11 Division One schools will be together on the fast Mines Falls course as well as Tyngsboro, MA and four D2 schools. Among those teams, 5 of the NH Top 10 ranked teams, including #1 Bedford and #2 Pinkerton, all square off for the first time this season. Even though it is only mid-September, I am quite sure this will be a fast race with some surprises. NH#1 Bedford is the favorite as they have surprised people early season with their strength of the top 5. Bedford girls were only ranked #3 pre-season, but quickly flew to the top of the list after winning the Cofrin Classic. They have one of the states fastest returnees with Leya Salis, who will give them a small number to start. Then it will depend on their next few to see if they can beat Pinkerton once again. NH#2 Pinkerton Academy was the pre-season favorite, but hasn’t looked as strong as was first predicted. However, Coach Bernard knows how to get her girls ready for when it matters most, which is the end of the season. So, don’t count them out yet. As for tomorrow, I think they will have to be stronger than they have been so far if they are going to beat Bedford. Most likely, they will be second. After the top two teams there should be quite a gap to the next bunch of teams. Alvirne (NH #4), Merrimack (NH #8) and Concord (NH #9) should be the next group fighting to break into the top 3. Early season bid goes to Alvirne, who is looking exceptionally strong. However, Merrimack and Concord appear to have been holding some of their varsity members back early season so they may be stronger than the rankings show. Manchester Central hasn’t shown their true strength yet, so they aren’t even in the NH top ten rankings. However, don’t be surprised to see them moving into the top 10 after this weekend. Six of the top ten Division One returnees are in the race, so expect it to be a fast one. Individually, Salis should run away with it defendin g her title from 2015. After her, there will be a group of Pinkerton girls (Maison D’Amelio, Ciara April and Jordan Vaillancourt) along with North’s Arianna Braccio and Bedford’s Carline Mahoney and Delaney Flanagan. Central’s Jennika Mannesto and freshmen twins Keegan and Katelyn Pepin could break into the top 10 as well as Alvirne’s Katie Bellomo and Jess Fontaine. The weather will be perfect, the course is fast and a lot of the top schools will be there. Seems like Nashua will be a great place to be tomorrow morning if you want to see some great XC racing.